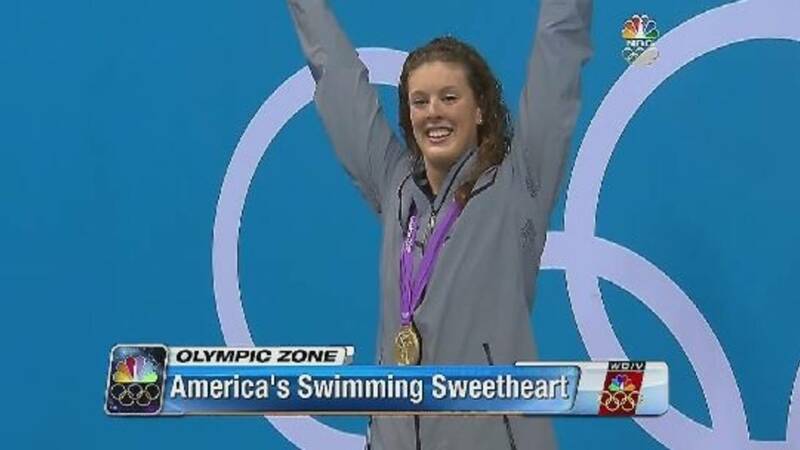 CANTON TOWNSHIP, Mich. - Michigan's own Allison Schmitt is known as the swimmer with a smile, the happy one by the pool. The Olympic freestyler will tell you now that the smile was real, but she was also secretly struggling. Schmitt won five Olympic medals during the 2012 summer games in London. Three were gold medals in the 200-meter freestyle race, the 4x200-meter medley relay and the 4x100-medley medley relay. She won a silver in the 400-meter freestyle and a bronze in the 4x100 meter freestyle relay. She returned to her hometown of Canton Township on a high, greeted by family, friends and fans. But then, the high turned into a low. "There's this thing that they call post-Olympic blues and I think I had a little bit of that and I kept isolating myself and isolating myself. So, I just kept digging into a hole," Schmitt told Local 4. "I didn't really know how to describe it, I just wanted it to go away and to be happy and to be kind of like my old self." She had begun suffering from depression. She said she wasn't good at asking for help and that might have been part of the problem. "I would just want to sleep all the time and someone asked me, 'What do you look forward to getting up in the morning?' And what I looked forward to was going back to sleep," Schmitt said. "I would never really respond to my messages or phone calls; especially to my mother because I feel like she has that mother sense that if there was something wrong she would always call me when I was crying and I would be like, 'How does she know?'" Schmitt kept quiet about what she was feeling for quite some time, but in January she opened up to the three people who are closest to her. "I don't think anyone put any pieces of the puzzle together, because even outside the pool I could still put a smile on, I could still have fun," Schmitt said. However, her friend and teammate Michael Phelps did notice and said something during a swim meet in Austin, Texas, in January. "At the Austin Grand Prix, I walked out after the 400 (meter freestyle) where I probably didn't give it my all, but I pretended I did," Schmitt said. "Michael had said something to me. He said, 'Hey, I can tell,' we had been going to practice for the past few weeks together, and he said, 'I can tell in the past few weeks you're not acting yourself. Something seems weird. If you need help just let me know. I have been through it and there is other people I can have help you.'" Schmitt said she started crying on the pool deck. "I just started crying and I said, 'I do need help,'" she said. She confided in Phelps, and two of her coaches; Bob Bowman and Keenan Robinson. "It was quite a surprise to me because when you have someone who had an Olympics like she did, it wasn't just up to our expectations, it surpassed our best expectations. So, you immediately think, 'What could be wrong with that?' I just don't think she was ready for the way her life would change and how other people saw her after that. It was just very difficult," Bowman said. Schmitt began seeing a psychologist, but was not yet ready to share what she was going though. "I was still embarrassed to say that I was seeing a psychologist, I would say I was going to a meeting or I had an appointment," Schmitt said. In fact, Schmitt did not share her struggles with her parents or the rest of her family until May after her cousin, April Bocian, committed suicide. Bocian, 17, was a star basketball athlete and also suffered from depression. Schmitt tears up while taking about Bocian. "I wanted her to know that she wasn't alone," Schmitt said. It was after her Bocian's death that Schmitt confided in her parents and her family that she too was suffering from depression. She recalls what April's mother told her. "I remember aunt Amy saying to me, 'The first person April saved is you' because I wouldn't have said anything if that hadn't of have happened," Schmitt said. Schmitt feels compelled to share her story to help others and honor her cousin's life. "Knowing that there are other people out there that feel the same way, I'm willing to share my story and know that it's all right to feel that way but it's also all right to ask for help and not keep it all in and think that you're battling it alone because there are so many people out there that love you," Schmitt said. "If I can help one person, if I can help 1,000 people, anyone. I'd like to save one life and I know that April is up there doing her work and saving lives. If she could save a million lives she'd love that. Her sunshine will shine down and hopefully save a few other lives out there." Schmitt admits it was not easy sharing how she was feeling. She said even though it was a hard time earlier this year after she started getting help, she has learned more about herself and it has helped her to do so. "It was definitely really hard for me. I didn't want to show my weakness," Schmitt said. "I didn't want to ask for help but in this situation I found out it is a situation that I need to ask help for, that I couldn't keep fighting it by myself." With the Summer Olympics in Rio less than a year away, Schmitt is focused on qualifying and competing in her third Olympics. She is training in Arizona under Bowman. She is also seeing a psychologist regularly. "I'm really excited right now. I think I'm in a good spot mentally and physically. I think that we've been training really well and going to the psychologist every week has definitely helped," Schmitt said. "I'm going to keep going to the psychologist through out the time because, like I said earlier, it's more of a rehab or even a prehab if I'm perfectly fine to make sure nothing else goes wrong."